On March 10th 1535, the Bishop of Panama while en route to Peru, with a few ships, got becalmed and the currents derived them on a westerly route and accidentally caused a major breakthrough in the future history of naturalism, evolution as well as a huge tremor in religion. He discovered the Galapagos Islands! Here they landed searching for water and food of which they did not find much to solve the problem with men and beasts they carried. This is considered the official discovery of this, later to become one of the most famous archipelagos in the planet. Through the years 1593 to the mid 18th century islands became a safe haven for pirates and buccaneers English and American with a few French and Dutch. It was the perfect place to become an operational center for the “expeditions they made to the different Spanish ports on the western shore of South America. Many tortoises and “guanos’ as they called the iguanas, ended up in their pots and grills. The first maps to include the islands were the ones prepared by Abraham Ortelius and Mercator around 1570.The islands were described as “Insulae de los Galopegos” (islands of the Tortoises). 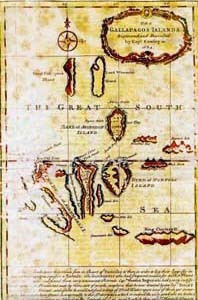 Around the year 1684, a pirate and scholar of sorts, William Ambrose Cowley draws the first chart of the Galapagos naming some of the islands honoring British royalty and naval vessels and admirals. Later in the 1700 whalers, sealers, and others, used the islands as a place for provisioning with tortoise meat, seal skins and other animals and or birds placing in extreme danger the populations of Giant tortoises and fur seals especially. On Charles Island, on February 12 and under the Presidency of General Juan Jose Flores, Coronel Ignacio Hernandez took official possession of the archipelago on behalf of the government of the Republic of Ecuador, that same day the name of the island was changed from Charles to Floreana to honor the first President of Ecuador. The Galapagos Islands then changed their name as well, into “Archipiélago del Ecuador”. Three years later the islands were visited by a young naturalist who remained on the archipelago for a mere 5 weeks. He came on the English Navy’s research ship HMS Beagle and remained from September 15 to the 20th of October 1835. During this period of time, the young Charles Darwin visited San Cristóbal, Santiago, Floreana and His reports and journals about the flora and fauna of this amazing islands, helped him to a large decree to formulate his theory on evolution of the species, and later in the year 1859 he published his famous book “On the Origin of Species by Means of Natural Selection”. In 1892 the name of the Archipellago changed again and this time to Archipiélago de Colon and the islands names are changed to Spanish in relation to the “discovery” of America by Columbus. This is why some of the islands have up to five different names. During World War II the American forces occupied the archipelago and built a large naval and air base on the island of Baltra and remained for the duration of the war and up to 1948. On the 4th of July 1959 the Government of Ecuador declared the islands a National Park including all areas that have not been colonized, establishing boundaries. In July 24 the Charles Darwin Foundation was created and in 1964 the Charles Darwin Research Center was inaugurated. In February 18, 1973 the Galapagos Islands became another Province of Ecuador. In 1978 the UNESCO declares Galapagos as a WORLD NATURAL HERITAGE SITE. In March 18, 1999 the GALAPGOS MARINE RESERVE was created. During the 1960’s tourism started on an organized scale and during the mid eighties a tourism boom escalated and by 1998 the increase was estimated in yearly 8%. This created strong pressure on the natural resources, the danger of introducing foreign exotic non native species also increased. Large quantities of Ecuadorians came to the islands lured by the dollars that were pouring into the islands due to the increase in tourism, which caused an increased demand over soil, basic services, etc. In other words… "Development". Later, in the year 1998 the Special law that was created for the protection of the Galapagos: "Ley de Régimen Especial para la Conservación y Desarrollo Sustentable de la Provincia de Galápagos". It is the hope of everyone that this law will help reduce the threats that might put Galapagos in peril.